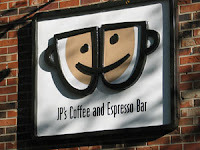 With a cup of steaming java from JP’s Coffee and Espresso Bar—the house blend created by owner Jack Groot--and homemade pastries baked by his sister, we sit at a street side table and wait for the Firetruck Parade to begin. Soon sirens break the reverie, and our heads turn toward Main Street to watch gleaming red trucks make their way noisily through town. It’s October in Holland, and although Main Street has a decidedly European flavor, we haven’t been magically transported across the ocean. We are near the shore of Lake Michigan enjoying crisp autumn air in a town with unmistakable Dutch influence. 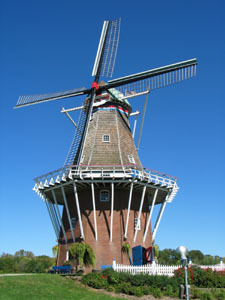 More than two and a half million visitors come to Holland each year. Named an All American City and one of America’s Dozen Distinctive Destinations, Holland embraces the quaint charm of old Europe and the blustering excitement of a modern city. Of the city’s 35,000 residents, 40 percent have Dutch roots. ﻿ Carved from the wilderness by Dutch immigrants in 1847, Holland settlers recognized that access to the outside world via Lake Michigan was essential to their survival. Ten years after petitioning the U. S. government for help in creating a channel, the farmers turned loggers took matters into their own hands and dug a channel deep enough for barges to pass. Still, it would be several more decades before the channel and harbor were substantially completed. As the town prospered, churches and stores were built. The railroad and steamboats came, along with a post office, newspaper, and quarry business. Tragedy struck when the Great Fire of 1871 destroyed 80 percent of the town. Determined to rebuild, city leaders rose above adversity to establish an even better and well-planned community. Hotels and resorts sprang up and flourished, an amusement park was added, and by the turn of the century, visitors had discovered Holland. Today Holland boasts a growing reputation for exceptional shopping, churches (170 representing 49 denominations), three colleges, and more than 1,500 acres of public parks. Downtown was revitalized during the 1990’s when a mall built on the outskirts of town threatened to overshadow the district. Now it’s a unique mix of mostly locally owned businesses. More than 85 shops, boutiques, restaurants and cafes offer something for everyone. Listed on the National Register of Historic Places, downtown Holland has been named a Great American Main Street for its ability to attract visitors year round--even in winter thanks to the underground snowmelt system that heats streets and sidewalks. Don’t miss the Farmer’s Market, an institution so popular that the city built a permanent facility to house the market. 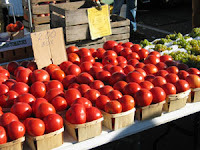 A bustling assemblage of people and produce, the market swarms with hometown folks and visitors alike looking for fresh tomatoes, corn on the cob, pumpkins, peppers, and myriad varieties of blooming flowers. As you’d expect, there are many decidedly Dutch attractions. At Windmill Island, you can climb up the last authentic windmill to leave the Netherlands—a working structure built in 1625. From the top of DeZwaan Windmill, we had a panoramic view of manicured gardens, dikes and canals. Children and adults enjoy the Dutch Village Theme Park, where we heard the beautifully carved street organ play melodies derived from brown punched paper. 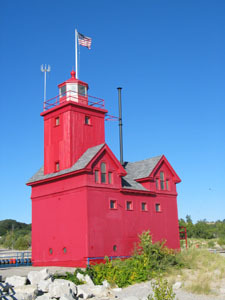 We also visited Big Red, Michigan’s most photographed lighthouse. The small, square, wooden structure situated at Holland Harbor overlooking Lake Michigan was erected in 1872. After a short tour, we stopped to savor bayside seafood stew and black pearl salmon served at nearby Piper Restaurant overlooking the harbor.